If you are a fan of the Ferrari F12 Berlinetta and is a Hennessey admirer, then here is something to put a smile on that face – an 800 hp F12 packed with the might of an HPE800 kit. After proving themselves as experts in tuning American muscle cars, sports cars, sedans, SUVs and trucks, Hennessey Performance is now expanding to the business of making European supercars more badass. We’ve seen their experiments with the McLaren range. Now it’s the turn of Ferrari. Recently, the tuning house released a teaser video of the Ferrari F12 Berlinetta endowed with an HPE800 kit. In its standard guise, the F12’s 6.3-liter naturally aspirated V12 produces 730 hp and 509 lb-ft. More than adequate to launch the Ferrari from 0 to 62 mph in 3.1 seconds and to a top speed of 211 mph. Its successor – the Ferrari 812 Superfast – is a major improvement in every department with 789 hp and 530 lb-ft churned out by the 6.5-liter naturally aspirated V12. It’s quicker than the F12 too, though the top speed remains the same. Back to the Hennessey. Going by the nomenclature pattern followed by Hennessey, this is an 800 hp F12 Berlinetta. That’s a decent 70 hp leap over the standard car, though it isn’t that far from the 812. 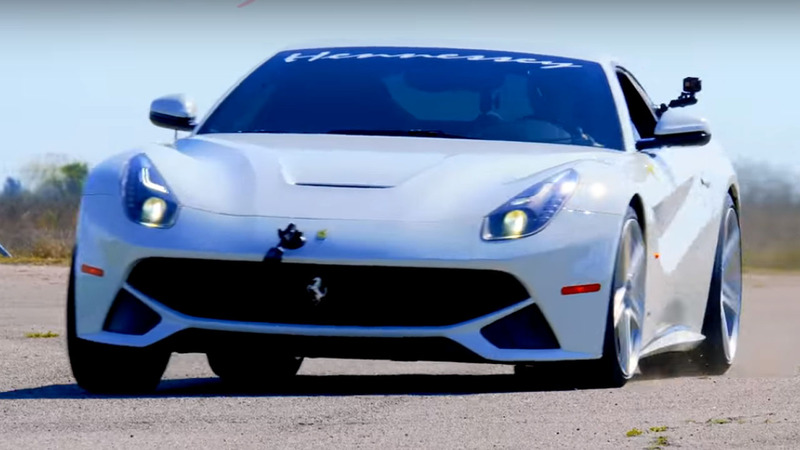 Hennessey hasn’t released any other details on the tuned F12 Berlinetta than this video which oddly starts with some cows grazing on the meadows before the drone camera spots the white Ferrari thundering down the Hennessey test track. The car sounds glorious and that’s something which makes us wonder if the tuner has worked on the exhaust. Oh, don’t get us wrong. 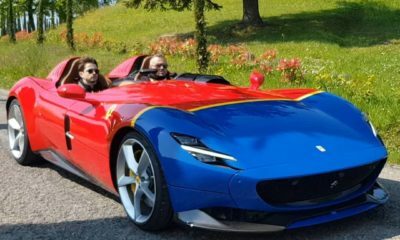 The Ferrari sounds amazing even without an aftermarket exhaust. We’ll keep an eye on the Hennessey Performance pages and post an update as soon as the Texas shop declares more details. Here’s what we think. The HPE800 could be a stepping stone of some kind for Hennessey as far as their experiments with the F12 are concerned. What if they have a 1,000 hp HPE1000 pack in the works? We’d love to see that happening for sure.